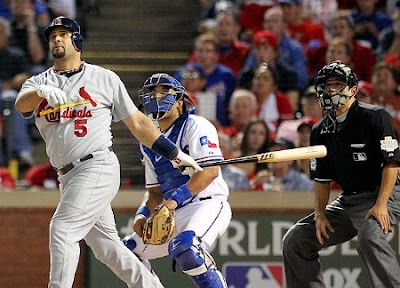 I guess Albert Pujols took all that negative talk about him following St. Louis' Game 2 loss to heart. Tonight in Game 3, he proceeded to take his frustrations out on Texas pitching, and in the process delivered what may have very well been the single-greatest performance in World Series history. Playing like a man possessed, Pujols went a blistering 5-for-6, with 3 home runs, 6 RBI and 4 runs scored as the Cardinals destroyed the Rangers by a final of 16-7, to take a 2-1 series lead in the Fall Classic. His three homers tied a series record held by Babe Ruth and Reggie Jackson. The five hits equaled a mark held by Paul Molitor, and his 6 runs batted in tied the record held by Bobby Richardson and Hideki Matsui. Oh, and Pujols also set a series record with 14 total bases, and became the first player to get a hit in four consecutive innings. "It's pretty special," Pujols said of equaling the power feats of Ruth and Jackson. "Those guys were great players. To do it on this stage is amazing. At the same time, I didn't walk into the ballpark thinking I'd have a night like tonight." Pujols went 0-for-6 in the first two games of the series, and was called out for avoiding the media after his error in the 9th inning helped contribute to St. Louis coughing up Game 2. So, while Pujols may not have expected to have a big game this evening, perhaps everyone else should have seen it coming. After all, talk tends to wake a sleeping giant. Be afraid Texas. Be very afraid. Albert went total beast mode. LOVE it. That was an amazing performance by the games best player. Kudos to Pujols. It would probably be in the Rangers best interest to intentionally walk Pujols every single time he bats the remainder of the series.